Arms of Murray Beauclerk, Duke of St Albans: Grand quarterly, 1st and 4th grand quarters: the Royal Arms of Charles II, viz quarterly: 1st and 4th, France and England quarterly; 2nd, Scotland; 3rd, Ireland; the whole debruised by a baton sinister gules charged with three roses argent barbed and seeded proper (Beauclerk); 2nd and 3rd grand quarters: quarterly Gules and Or in the first quarter a mullet argent (De Vere). Duke of St Albans is a title in the Peerage of England. It was created in 1684 for Charles Beauclerk, 1st Earl of Burford, then fourteen years old. King Charles II had accepted that Burford was his illegitimate son by Eleanor Gwynn (commonly known as 'Nell'), an actress, and awarded him the Dukedom just as he had awarded the Dukedoms of Monmouth, Southampton, Grafton, Northumberland and Richmond and Lennox on his other illegitimate sons. 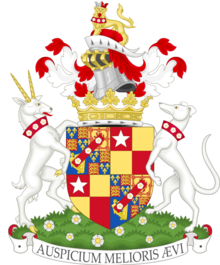 The subsidiary titles of the Duke are: Earl of Burford, in the County of Oxford (1676), Baron Heddington, in the County of Oxford (1676) and Baron Vere, of Hanworth in the County of Middlesex (1750). The Earldom and the Barony of Heddington are in the Peerage of England, and the Barony of Vere is in the Peerage of Great Britain. The Dukes of St Albans also bear the hereditary title of Grand Falconer of England, and Hereditary Registrar of the Court of Chancery. The eldest son and heir of the Duke of St Albans is known by the courtesy title Earl of Burford, and Lord Burford's eldest son and heir is known as Lord Vere. Recent Dukes of St Albans have not held a landed estate. Former seats of the Dukes of St Albans were Bestwood Lodge in Nottinghamshire, now a hotel, and Upper Gatton Park in Surrey. The accepted pronunciation of the family surname Beauclerk is reflected in the original alternative rendering Beauclaire: boh-clair. The heir apparent is Charles Francis Topham de Vere Beauclerk, Earl of Burford (b. 1965) (only son of the 14th Duke). The heir apparent's heir apparent is his only son, James Malcolm Aubrey Edward de Vere Beauclerk, Lord Vere (b. 1995). Only those at positions 1 to 6 are in remainder to the Barony of Vere. ^  Sale brochure for Upper Gatton Park, June 2016.